This butter keeper is so cute, I’m dying to have one, but I’m going to give one away to one of you instead! 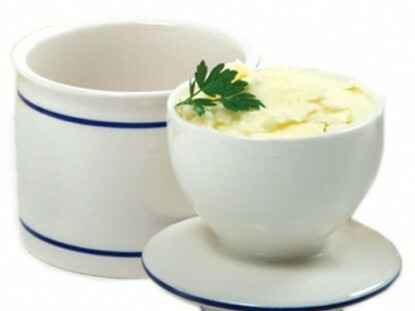 It’s a little ceramic pot that keeps butter soft and spreadable at room temperature for up to 30 days. It’s a really neat trick that works by creating an airtight seal with water you put in the base. What will they think of next? For a chance to win: Submit a recipe then leave a comment on this post telling me the name of the recipe you submitted! You can enter multiple times for this contest by submitting more than one recipe. Leave one comment per submitted recipe for multiple chances to win. One winner will be drawn by random comment number to receive the cute and handy butter keeper. Eligible entry cut-off is midnight Eastern (U.S.) time Sunday (May 16). This post will be updated with the winner by 9 a.m. Eastern (U.S.) time Monday (May 17). Return to this post to see if you won. This giveaway is open all weekend! UPDATE 05/17/10: The winning comment number, drawn by random.org, is #65, Moopsee. Email me at CITRgiveaways(at)aol.com with your full name and address for shipping! I’ve been looking for one of those but can’t find one except online. I submitted a recipe for homemade granola bars. My kids love them and they don’t have any corn syrup in them!! This is the cutest thing….I’d really like to win this item. I submitted a recipe for an appetizer called “Party Rye”. I submitted the Chewy Granola Bar recipe I made last night. My kids devour the store bought ones so I adapted the All Recipes version to make it healthier. Kids still love them!! I just ordered a butter crock from Amazon!! I needed a good storage solution for the wonderful Amish butter I bought from the local Amish bulk food store. I can’t believe how much better that butter tastes than the regular store bought stuff! I added yogurt cheese savory or, sweet to the recipe files today. It’s listed under a whole lot of categories so it will be easy to find. I would love to win the butter keeper too! I’ve seen these and wondered about how they worked. Pretty cool. The recipe I submitted is Cider Braised Pork with Carrots and Onions. That butter keeper is so cute! My SIL makes this and calls it Dreamsicle Fudge but I have also seen it as Creamsicle or Orange Creamsicle Fudge. Put in a recipe for Corn Cakes. We had them last night with dinner and my husband had leftovers with syrup for breakfast. HELP…I always seem to have trouble finding out who won the previous contest! Who one the Ball Blue Book??? Nancy, winners are always posted on the same post with the giveaway, updated with the winner after the contest closes. The BBB contest was on my cooking blog on my regular site, so find it over there! Hey there! I submitted a recipe for Rhubarb Cake. It is delicious! I posted Pigs in a Blanket! These butter bells are great I bought mine from the local cooking store. The only down side is to remember to change the water every 3 days. The butter stays so soft their great to have. I have looked at butter bells for years, but never purchased one. Time to get posting on the recipes so I can have a chance at one for free! I posted a recipe for French (almost Russian) Dressing. I posted an Almond Pound Cake recipe that I found on a the self-sustained living blog. It’s great plain but I’m thinking it would be fantastic with strawberries over it! Janie’s Broccoli Cheese Rice casserole has been posted. I have to see how many other recipes I can get posted to increase my chance of winning that butter bell! My 15 y.o. daughter will no longer eat margarine because her health teacher told her class how close margarine’s molecular composition is to plastic, so now she only wants real butter. I don’t really mind though because I like butter better anyway but it would be fantastic if it was room temperature and could be spread easily. I submitted Smoked Trout Spread. My daughter begs for this when she comes to visit. I submitted Perfect Pumpkin Pie — a terrific recipe! Thanks for sharing this opportunity to win! I added “Pastelitos” it’s a cookie recipe! Melt in your mouth! I want to go eat some right now! These other recipes people added look great too! I’m going to have to try them out! I submitted Mom’s Whipped Shortbread Cookies. YUMMY!! I submitted Oatmeal Pancakes — great variety on a traditional dish! Cool!I have been wanting just such a butter keeper. The recipe I submitted is for White Chicken Chili. and Pineapple/Green Pepper Cheese Ball. I submitted my Dad’s Chili! Now I have to go shopping and make some. Hi Suzanne, I’ve submitted my recipe for Pina Colada Fruit Salad. It’s always a hit whenever and wherever I serve it. I hope you like it! This salad is quick & simple to prepare. It’s great for a quick breakfast with fresh hot muffins! I’d love to have your Butter Keeper to display beside this salad with some muffins. I submitted a fantastic recipe for Frosted Cherry Pie that my family snarfs down the second I make it. Think warm, homemade, Hostess Cherry Pie with almonds on it. Aarrggh. It’s so good. Especially with ice cream or cold milk. I also submitted a second recipe today. This one is for Fresh Fruit Dip. I’ve been making this for over 40 years and everyone loves it. It’s fast and super easy to make, as well as pretty to serve. Great for Bridal or Baby showers. I just posted a recipe for Avocado mold in the jello area. I submitted a recipe for a chinese noodle dish called Gon Lo Mein – a dried tossed noodle dish. I just submitted Smothered Country Squirrel. I submitted a recipe today for Lemon Drenched lemon Cake. Love that little butter bell now I just need to hope being an overseas poster doesn’t preclude me from being “in to win” as the saying goes. I submitted a recipe for an Egg Casserole. Make it the night before, put it in the fridge and pop it in the oven in the morning. Whip up some muffins and OJ and you have breakfast. Submitted a recipe for Creamed Cabbage. Uses cream cheese in the sauce. Good side dish with Ham Loaf or Ham Balls. I have this very same butter bell and I love it. Keeps the butter perfect for spreading. Sometimes a pain to remember to keep the water changed, but well worth the effort. I’ll skip the contest since I already have one, but good luck to the rest of you posters. The lucky winner is gonna love it. I submitted “Simple No Cook Graham Cracker Pear Dessert”. I’ve been eyeing one of these bells for months now and just haven’t ordered one. Hope I win! I also submitted: “Homemade Turkey Sausage”. I left a recipe for Cornbread Casserole. You’ll be amazed how good it is. I submitted a recipe for Broccoli Salad. It’s always a big hit at cookouts and is delicious. I submitted a recipe for Black Bean Salsa. Gonna make some of Dede’s Rotel so I’ll have plenty to make salsa! Then I had to submit Mrs. Beecher’s Cocoa Cookies, to make up for the healthy in the other recipe. I just added the Tamara’s Egg Bake. Got it out of the local paper a couple of weeks ago. Tried it this morning & it was great. Seasoned crackers. This is the best at Christmas or for parties. My friend made huge amounts of this for gifts & would make it in a 30 gallon garbage bag. Seafood salad. Great for summer meals when it is too hot to cook. I posted German Apple Pancake! Would love the butter keeper. I submitted Black beans and yellow rice. I submitted Sour Cream Pound Cake! I submitted Sweet and Sour Pork Chops. Ooops — should have been Old Fashioned Pumpkin Nut Loaf. The Pumpkin Bread was submitted earlier in the week! Strawberry Merlot Jam posted now in recipes … just finished a batch, including the BWB. Haven’t done this recipe since fresh strawberries last year and, lordee, did it ever smell good while cooking! I put in the pecan pie muffins. Enchilada Casserole posted … my family prefers this Mexican-style casserole over the time-consuming enchiladas. Doesn’t break my heart as easy assembly of anything home cooked is always a personal preference! My recipe is “Nadyne’s Grated Sweet Potatoes” and it is a MUST TRY for anyone! This submission is for 3C Bread. The 3 C’s are: Cherries, carrots, and coconut! This bread is wonderful when heated, with a dollop of butter melting on the slice………..
Home-made Chocolate Ice cream….I’m getting hungry! Its only fair that I also leave a recipe for Vanilla Ice Cream. This is also delish when you add fresh chopped fruit! Breakfast Stuffing is one of my own … a take-off on bread stuffing with a lot more egg!